Last spring I led an intrepid group of eaters around five ice cream stands that make their own hard ice cream on site. To garner a fair comparison I had called ahead to see which flavors would be a common denominator across the board. Vanilla, chocolate, strawberry and coffee weren't surprising. Butter pecan kind of came out of left field. But I never expected maple walnut to make the list. Chocolate chip wasn't available at five local ice cream shops but maple walnut was? With over two dozen participants, not a single one of them chose to spend the afternoon eating five different scoops of maple walnut ice cream. So I was left wondering about this improbably popular flavor. That is until that fateful day that maple walnut was the ice cream flavor of the week at Stewart's. For those who know, that means instead of a half gallon costing $4.29 it was just $3.19. That little bit of a price break was just the nudge I needed to try something new. 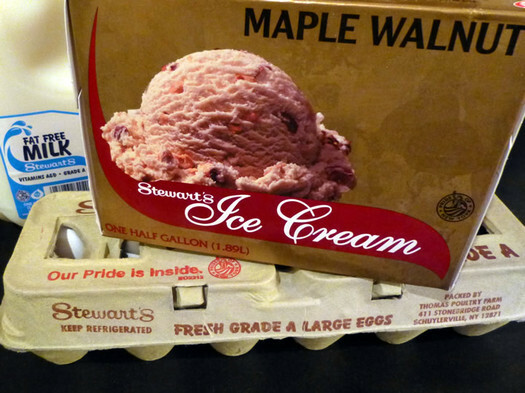 Stewart's uses a natural maple syrup flavor. So it's unfair to compare it to the stuff that comes from the trees. Still, the ice cream captures the caramelized sweetness of actual maple syrup. And it's subdued enough to let the sweet cream of the dairy shine through. Frozen walnuts add not only a buttery crunch, but also a brilliant balancing bitterness that keeps the other flavors in check. It's an adult flavor. Which isn't to say my kids don't like it. They do. They just aren't crazy about the walnuts. But hey, that just means more walnuts for me. As it is, there are plenty of large chunks of these tree nuts scattered through the ice cream, but I can never get enough. Did you hear about how walnuts can also reduce your cholesterol? True story. Winter may not seem like a great time to eat ice cream. But maple tapping has already begun as the daytime temperatures creep above freezing and plunge back down below at night. And when the next batch of real maple begins to flow, I suspect I'll find some way to enjoy it with walnuts. Because this combination of flavors is fantastic. Sound yummy...sweet, salty, and crunchy! Actually, I found myself want to eat ice cream more as temperature drops. Winter + ice cream = yum! Some years ago, before Fairdale Farms in Bennington became part of Garelick Farms, they used to have tiny little burger-and-ice cream shop right there at the dairy. I used to love the burgers with real cheddar and maple-cured bacon, but what really drew me there was the maple walnut ice cream. I'd make the trip from Albany to Vermont just for that. And I still miss it. But Stewarts' is a close second. Any time of year is a good time to eat ice cream, just as long as you aren't trying to do so outside. My concern with an ice cream like this would be that it'd be too sweet or the maple syrup flavor would be cloyingly fake. It sounds like that's not the case here--and it might be time for me to try some. 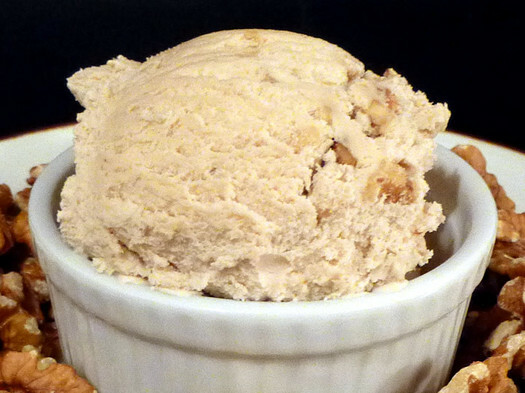 Given its flavorful blend of maple and dairy, as well as its particular deliciousness, let us hereby resolve to nominate Maple Walnut Ice Cream as an official New York State food. 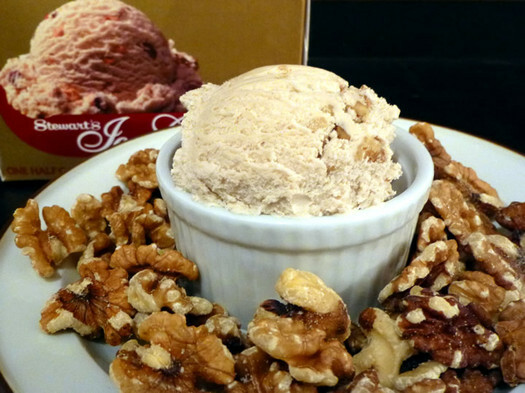 So the walnuts (may) reduce your cholesterol.. but they're found in the very rich, sure-to-raise-it ice cream? Fancy food styling, Daniel B.! Those boxes are so inconvenient and that plastic sheet doesn't "protect flavor" at all. I'm such a fan of Stewart's, having grown up with them (anybody else remember the "Bread 'n' Butter Shops"? ), but two things about their ice cream are a constant disappointment. One is that if you control the entire distribution chain, there's really no excuse for artificial flavors and additives; no one is in a better position to deliver all-natural ice cream. And the second is the box. 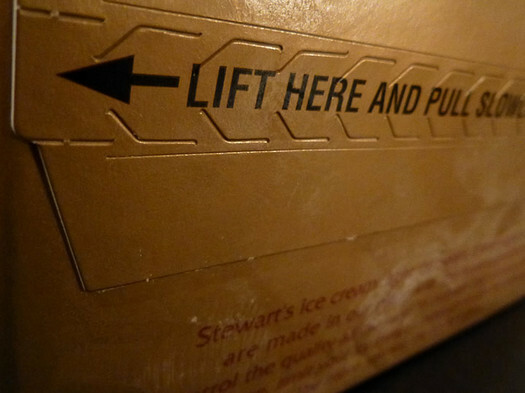 Since I was a kid I've found the lid so likely to rip that I almost always end up undoing the end flaps, gingerly lifting the lid off and then reassembling the box. Crumbs along the Mohawk ...ummmm yeah..that's all. The cultural anchor of Upstate, indeed - I think if I ever moved away the two things I'd miss the most are fish in a hot dog roll (I didn't notice that these weren't everywhere until Daniel pointed it out) and Stewarts. And don't forget how cheap the ice cream is at Stewarts. We took our kids for hot fudge sundaes at Sundae School on the Cape and the bill for the four of us was around $25. And they weren't even "make your own sundaes".